The clock has started on a 48-hour campaign calling on Spartans to show how much they #BelieveInTheG. 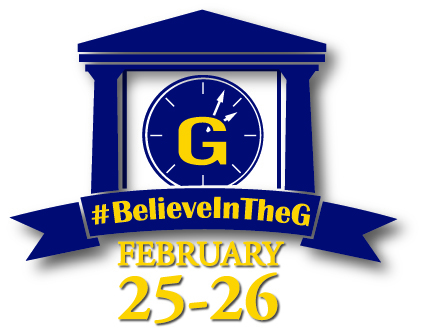 UNCG is hosting the second “Believe In The G Giving Challenge” Feb. 25-26. “We are asking 480 alumni, friends, students, faculty and staff to make a gift of any size to any area at UNCG in 48 hours,” says Emily Rector, director of UNCG Annual Giving. 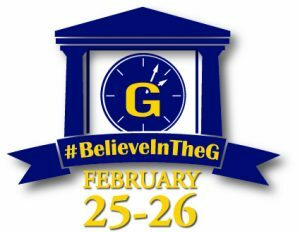 The campaign is targeting donors who favor social media, encouraging the use of social platforms to share the challenge, memes, pictures and messages using the hashtag #BelieveInTheG. There’s an added incentive in reaching the goal: Two challenge donors, Michael Garrett ’07 and Dr. JoAnne Safrit ’57, have pledged to give $75,000 to the university if the challenge reaches its goal of 480 donors in 48 hours. The giving challenge will also raise awareness about how gifts from donors help shape the student experience at UNCG, according to Sarah Kathryn Coley, associate director of development in Annual Giving. Some beloved campus landmarks, such as the Minerva statue, the Vacc Bell Tower and the Rawk, were made possible from generous gifts from donors. Make a donation of any size or find out details at www.believeintheg.com.